In the late 80's, near field microscopies got rich by a new technique when it has appeared that photons are emitted from the biased (V) tunnel junction (tip-surface) of a scanning tunneling microscope (STM). Soon, after the first evidence of the phenomena, contrast in the photon yield versus local morphology of the surface was reported. Its deep origin was a wide matter of debate during the last years. The high level of emitted photons indicates that the photon emission found its origin in inelastic tunneling and not by de-excitation of hot electrons. Tunneling electrons de-excite within the tunnel barrier (quantum view) or equivalently (electrodynamic view) in the coupling of inelastically tunneling electrons with localized tip-induced plasmon modes, which decay radiatively. According to this mechanism, the photon yield may depend on the local density of electronic states (LDOS), electromagnetic fields (plasmon radiation) and geometry of the tip-surface cavity. Before our experiment, variation of the surface plasmon was the selected interpretation. In order to make a decisive experiment, we proposed to explore the photon emission from the simplest possible system: a gold tip in front on a (111) Au surface. The surface exhibits the usual reconstruction with small corrugation not larger than 0.01-0.03 nm, depending on the tip quality. A high correlated contrast of the photon rate, is mainly observed for V>0. 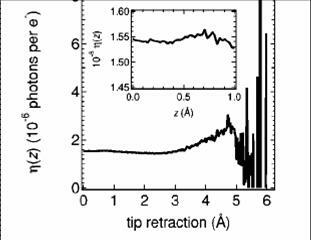 Upon retraction (z) of the tip, the very same exponential decay (over 4 orders of magnitude) of the electron current Ie- and the photon rate Iphoton is measured. One gets a very constant photon yield (Iphoton/Ie-) for tip-surface distances within the surface corrugation range. This discards the possible influence of the geometry of the cavity. The LDOS was further explored for V=+0.3 V (final states for elastic current) and V=+2V (final states for inelastic tunneling). It is measured that the LDOS modulation with respect to the reconstruction at 2V is twice as large as at 0.3V. This is precisely the necessary amount to interpret 100% of the measured photon modulation. 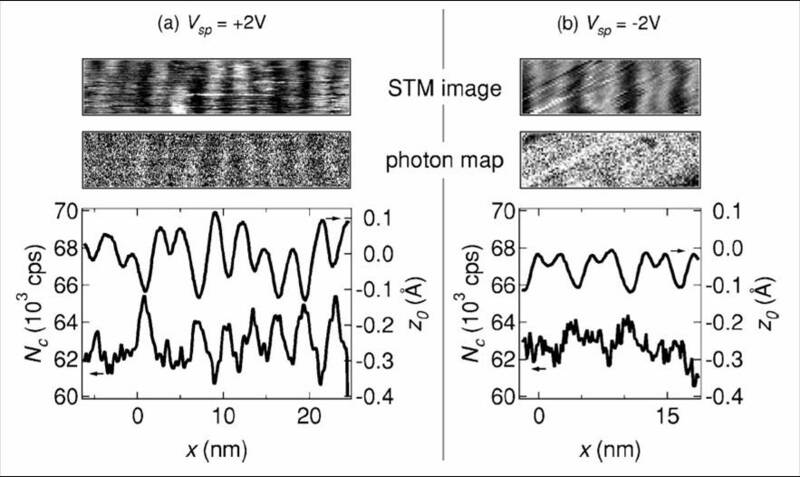 In conclusion, this experiment allows identifying the origin of the photon contrast observed by scanning a tunnel junction across a metallic surface. Such a contrast founds its origin in the relative spatial variations of the LDOS associated with elastic and inelastic currents. It is thus shown that photon maps directly reflect these LDOS variations. K. Perronet, L. Barbier, and F. Charra, Phys. Rev. B Rapid Com., 70, 201405(R) (2004).